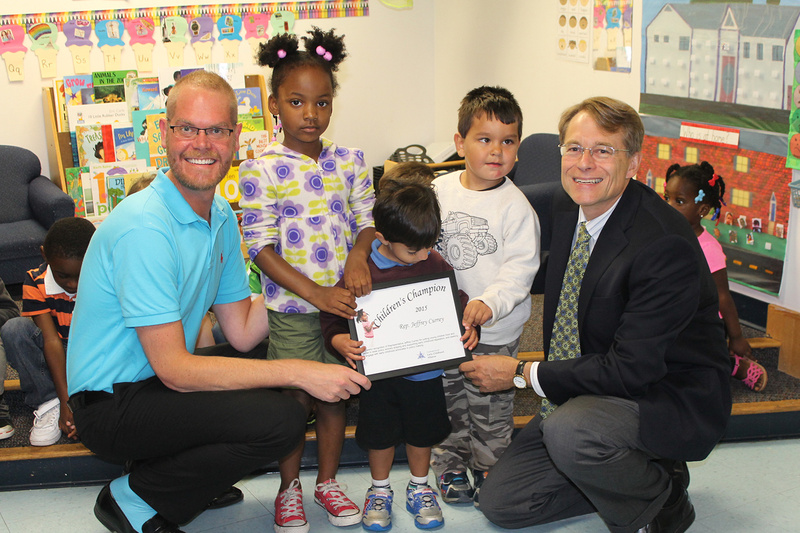 The Connecticut Early Childhood Alliance has named Rep. Jeff Currey (D-East Hartford, Manchester, South Windsor) a 2015 “Children’s Champion” for his leadership in shaping new legislation that promotes the well-being of Connecticut’s young children in the areas of healthy development, early care and education, nutrition and safety. “We chose legislators who are playing key leadership roles in policy issues that affect education for young children,” said Merrill Gay, CECA executive director, who presented the award to Currey. Much of this year’s early childhood successes centered on programs and services that were saved from elimination or major cuts in the biennium budget, including Community Plans for Early Childhood, HUSKY A, Early Literacy, Parent Trust Fund and the Children's Trust Fund, said Karen Rainville, CT Early Childhood Alliance co-chair and the executive director of CT Association for the Education of Young Children (CAEYC). Among the legislation passed, a bill that gives early childhood educators additional time to obtain their degrees, a bill that addresses safe sleeping practices for infants, a bill that implements a comprehensive mental, emotional and behavioral health plan; a bill that expands School Readiness seat eligibility by allowing programs to serve children who don’t live in the district; and a bill that would require law enforcement agencies to inform child care centers in emergency conditions.